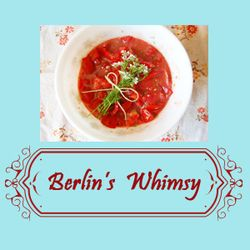 Berlin's Whimsy - I'm a rebel. I admit, whenever I go through a phase like I'm currently in, I feel a bit embarrassed. It's my cotton/utility knitting (and now crochet) phase---the kind that produces dishcloths galore and other little crafty items for the household. I think it was around this time last year that I knit up those Mason-Dixon Ball-band Dishcloths like crazy, as if some cotton-eating alien creature might drop from the sky and gobble up all the Peaches & Creme before I could whip up another dishcloth. But there's a side of me that worries about not fulfilling my "artistic" potential----worries about a lack of producing projects out of the newest organic yarn or the latest trendy craft book... For relegating myself to crafts-----even if they are necessary crafts that hands have been producing for centuries. And I ask, what does craft mean? Recently, I visited a cute little shop in a nearby tourist town. She carries so many fun handmade items, as well as materials to make your own. No, there isn't any Peaches & Cream there---rather, she carries Amy Butler decorator fabric and high-end craft stuff. The owner told me that she was laughing about a comment she overheard earlier in the day: a customer had walked through the door and said, "Oh, it's a craft store." The owner now was musing over that comment, "I'm not a craft store----I'm a fun store!" She went on, "I don't like the term 'craft' and I don't want to be labeled as a craft store." I wondered about that---how the term craft means so many different things to different people. My ex-husband always turned his nose up at craft. I think crafty meant frumpy to him. However, the term crafty is becoming a reclaimed term in a more updated way. For the hipster crowd, crafting is cool and crafting is a positive offshoot of DIY and re-purposing. Instead of crafty we're craftsters. It's almost a revolt against the factories and the machines, against uniform and cookie cutter----it's reclaiming our hands' accomplishment. Our spirit isn't too far behind. I grew up in the very tail end of a generation that seemed to snub craft. I think that for this generation, craft conjured up visions of housewives fettered to their kitchens and husbands sitting at the table tapping their fingers while impatiently waiting for their meal. Instead of crafting, this generation wanted to reclaim their professional identities and take on the world---to be young forever. That belief wasn't mine because I never lived it-----never was forced to live it. I wonder if the interpretation of craft stems from those generational views and experiences----perhaps where we fell in history. Now, craft is hip and it's a new form of bucking the system. Sure we could go down to the corner Wal-mart and buy a generic dishcloth made in China but instead, we would rather make our own. So, given the choice between the old and now this new type of rebellion, I think I'd rather be knitting up my own dishcloths rather than dropping acid and exposing myself to the latest venereal disease. Yeah, that's what my cotton/utility knitting phase is, it's my own rebellion against the system! Do you want to join me in my cause?